Since its inception, OnePlus has danced around the fringes of the smartphone market, catering to nerds and enthusiasts with spec-laden devices for reasonable prices. And unlike the Apples and the Samsungs of the world, OnePlus has thrived even though it really only makes one product a year, typically released in the spring and then refreshed in the fall. And while the OnePlus 6T is the expected remix to the OnePlus 6 I checked out earlier this year, it represents a big step forward for OnePlus as a major player in the phone game and for people who just want a damn good handset. Editor's Note: Sadly we don't get OnePlus phones in Australia, but we know you still want to hear about them. Previously, in order to attract new customers, OnePlus was largely reliant on word of mouth and efforts like collabs with streetwear brands to drive unlocked phone sales through its website. And that’s fine when a company is still in startup mode, but in the U.S. where just 12 per cent or so of smartphones are purchased as unlocked devices, that strategy puts some serious limits on a phone’s reach. 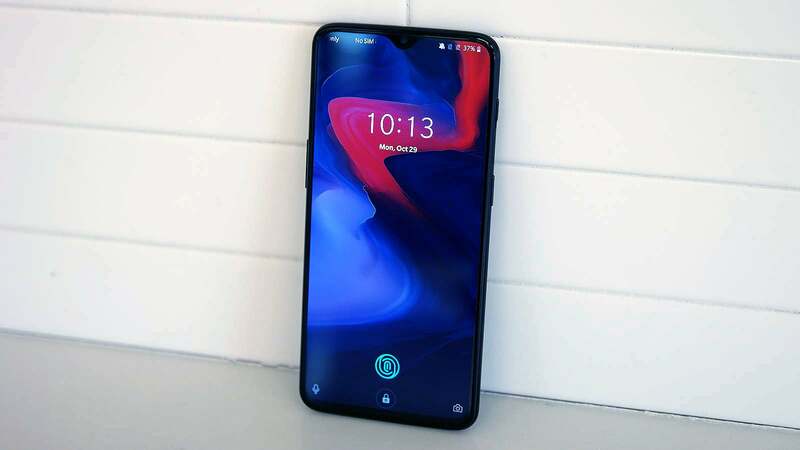 But starting with the 6T, OnePlus has partnered with T-Mobile to make its phones available for purchase in brick-and-mortar carrier stores for the first time ever. And on top of that, OnePlus also worked with Verizon to offer full compatibility with Big Red’s network, which is another OnePlus first. This one-two combo means that now, customers on carriers that collectively hold over 85 per cent of the U.S.’ wireless market can turn to a OnePlus phone as a real option for their next phone, a big improvement from past years when OnePlus devices were strictly limited to GSM networks. And with the 6T now available from T-Mobile, potential buyers can purchase the phone with monthly payments instead all at once—which for better or worse is simply how things are done in the States—thereby lowering the barrier to entry even more. 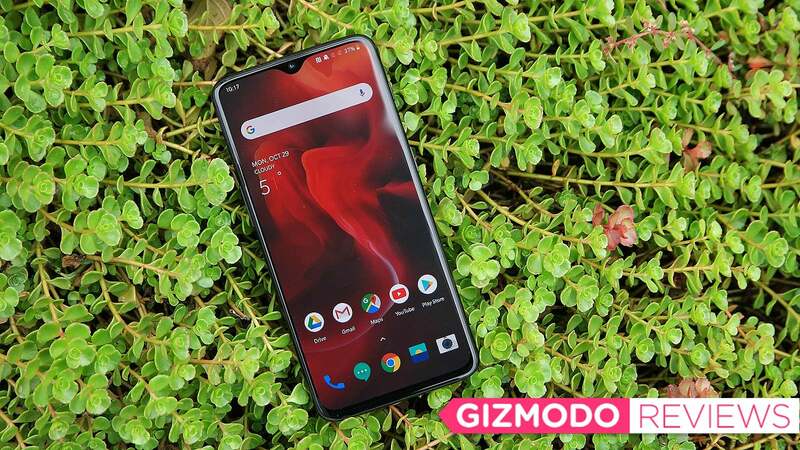 Meanwhile, on the tech side, while the 6T features essentially the same glass-backed design OnePlus debuted six months ago, the phone sports some clever new tricks, most notably of which is a new in-screen fingerprint reader. 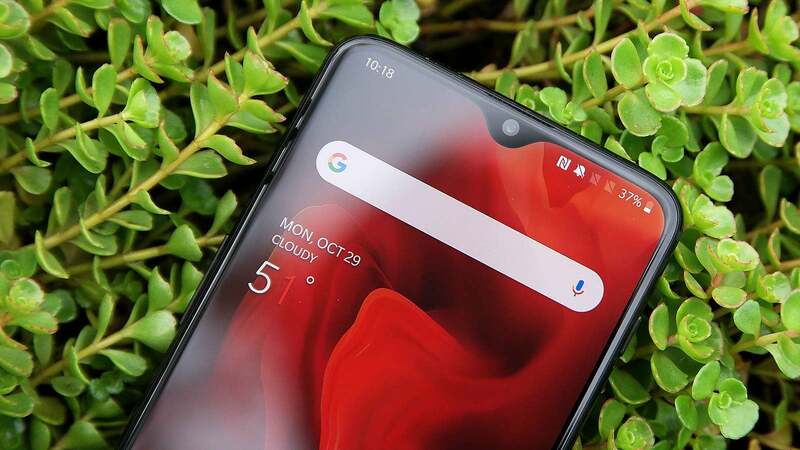 Yup, that’s right, before smartphone giants like Samsung, LG, or Apple figured out how to properly marry screens and fingerprint sensors, OnePlus (along with the help of its parent company BBK Electronics) is the first company to bring this feature to the U.S. in a meaningful way. 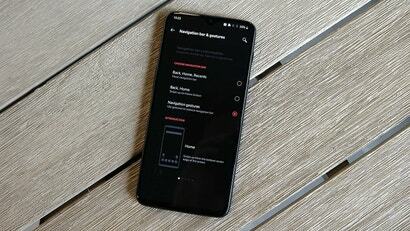 That means now you can have a front-facing fingerprint reader without needing sacrifice on screen size, and when combined with a new and more compact teardrop-shaped notch up top and only the slightest of chins down bottom, there’s even more of the OnePlus 6T’s 6.4-inch AMOLED screen to enjoy. 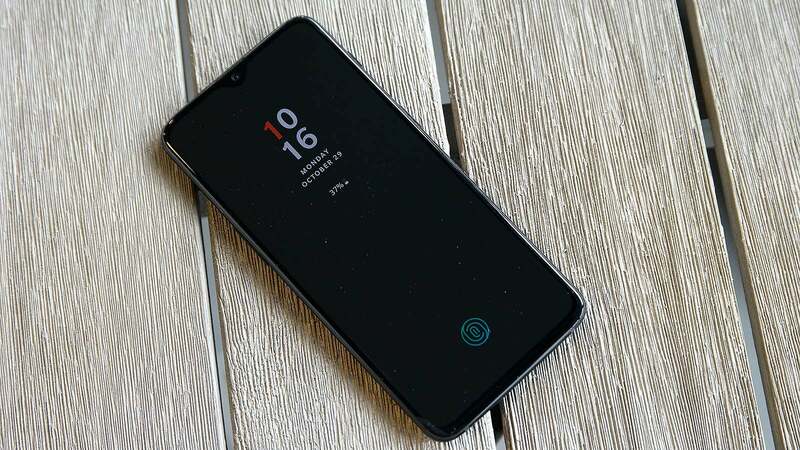 And with a claimed unlock time of 0.34 seconds, OnePlus says its integrated optical fingerprint reader is just as fast as the capacitive touch sensors used on the back of the OnePlus 6. The way it works is that beneath the screen, there’s a tiny camera that looks up at your finger, and any anytime you want to unlock your phone, it fires a green light at your digits to ensure the most accurate reading possible. In practice, things are even simpler. All you have to tap your finger on the scanner, and voila, you’re in. However, there are a couple things do have an impact on how fast the whole process really feels. To spice things up, OnePlus added three different animations to the unlock process, so there’s no doubt when that optical fingerprint reader is working. However, somewhat contrary to what you might think, you don’t actually need to hold your finger down until the end of the animation, which often takes longer than what the phone actually needs to ID your print, something that can make it seem like in-screen scanner is slower than it actually is. At the same time, I did run into a few situations where I pulled my finger away a bit too quickly, so there’s is still a bit of an adjustment, even if it’s mostly a mental one. Anecdotally, I found the in-screen fingerprint reader is less tolerant of off-angle taps, and like all fingerprint readers, OnePlus’ optical scanner can still be a bit finicky, sometimes require a long dead-center press instead of a quick tap to let you in. Unfortunately, there is a downside to the 6T’s in-screen fingerprint reader, because due to the placement of the optical sensor beneath the bottom section of the display, that left basically no room for a headphone jack. So instead of trying to move that port somewhere else, OnePlus said screw it. 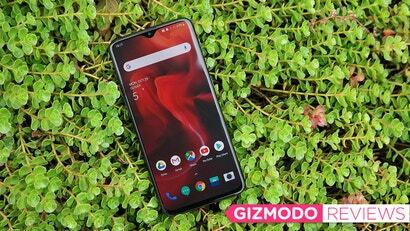 At this point, it’s hard to get too mad about that decision, as it’s clear that’s where the smartphone industry is heading, but since OnePlus along with Samsung was one of the few companies that previously hadn’t yet axed the headphone jack, it’s sorta sad to see more gadget maker say goodnight to our once beloved port. As for the rest of the 6T’s specs, you still get a Qualcomm Snapdragon 845 chip and your choice of 6GB or 8GB of RAM. 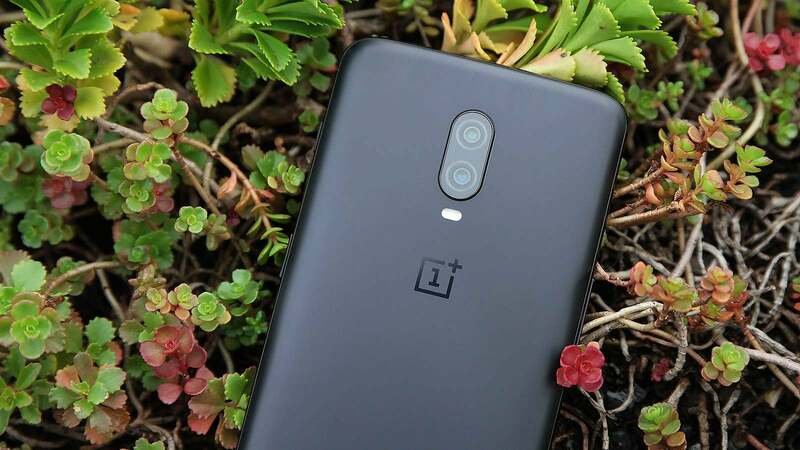 But the real bonus is that for the same $US550 ($775) starting price as the old OnePlus 6, the 6T’s base storage has been increased from 64GB to 128GB, with an optional 256GB model available for $US630 ($887). The OP6T’s battery has also received a sizable bump up from 3,300 mAh to 3,700, and the difference in longevity is quite noticeable. On our rundown test, the standard OP6 managed a solid 13 hours and 3 minutes, but on the 6T, we got an even better 14:37. That’s pretty damn good considering that despite having a bigger 4,000 mAh battery (though with a higher-res screen) the Galaxy Note 9 only lasted 14:11 on the same test. Elsewhere, the 6T’s other major improvements include enhanced portrait and selfie modes, along with a new Night Mode specifically designed to improve dynamic range and general image quality in low-light scenarios. However, in head-to-head testing against a Pixel 3, while OnePlus’ Night Mode did a solid job of cutting down on noise, I found it also oversharpened photos to the point where some bright lights pop out a little too much, while hard lines have halo artifacts around them. Night mode is a nice extra tool to have for when things get real dark, but it’s not exactly a game changer. The OP6T’s photo isn’t quite a rich or detailed as the Pixel 3"s but it’s close. Due to OnePlus’ Ai tuning, I actually prefer the OP6T’s image, even though the Pixel’s is a bit more accurate. Once again, the OnePlus’ Ai tuning results in a cleaner shot than what I got from a Pixel 3. This time, the Pixel 3 wins thanks to more saturated colours and sharper details. This is the difference OnePlus’ AI tuning makes. Some might call it overkill, but unless you see the change happening in real-time, the process isn’t quite as jarring. In normal low-light shots, the Pixel 3"s HDR+ photo mode still has an advantage. From the thumbnail, the two pictures seem pretty close, but if you zoom in, you can see where OnePlus’ Night mode goes overboard on the sharpening. As for normal photos, OnePlus has also hopped on the trend of using AI to identify objects and accordingly adjust the settings, except that on the OP6T, there’s no pop up or icon that tells you when it’s happening. OnePlus prefers a less intrusive approaching to AI photo tuning, which is generally fine, but it can result in situations where your pics suddenly look rich and more vivid when the AI kicks in. As a whole, while the OnePlus 6T can’t quite match the kind of pics you’d get from a Pixel 3, it comes damn close, and even in a few situations, even topped Google’s proprietary HDR magic. Lastly, while talking about software typically isn’t very interesting, I feel like it’s important to note how far OnePlus’ Oxygen OS has come. After years of streamlining, making animations feel smooth, and focusing on app management that’s based more on actual usage instead of simply how much RAM an app takes up, Oxygen OS sometimes feels like an even better version of Android than what you’d get on a Pixel. It’s super snappy, there’s no bloat, and you get bonuses like a built-in dark theme, UI customisations, and the choice of three different navigation setups (the three button Android nav, the Android 9 Pie “pill,” and full on gestures) that you don’t get from Google’s stock OS. In the end, while in absolute terms a Pixel 3 or Galaxy S9+ might be a better overall phone than a OnePlus 6T, are those phone’s really worth $US300 ($423) more? Or how about a whopping $US500 ($704) in the case of something like an iPhone XS? Sure, for some folks, the OnePlus 6T’s lack of wireless charging, a microSD card slot, and official water-resistance might be downers. But for all the people who say they want something fast and reliable for a decent price, the OnePlus 6T is your phone. It’s got excellent battery life, flagship specs, and a neat in-screen fingerprint reader Americans can’t really get on anything else yet. And now, thanks to wider availability and better carrier support, the OnePlus 6T needs to be a serious consideration for anyone looking to sidestep the onslaught of $US1,000 ($1,408) phones. While its original motto always felt a bit trite, five years after its start, OnePlus’ latest phone is closer to being a flagship killer than ever before. Thanks to things like OnePlus’ gesture navigation, a focus on smoothness, better app management and an built-in dark theme, Oxygen OS often feels like an improved take on stock Android. 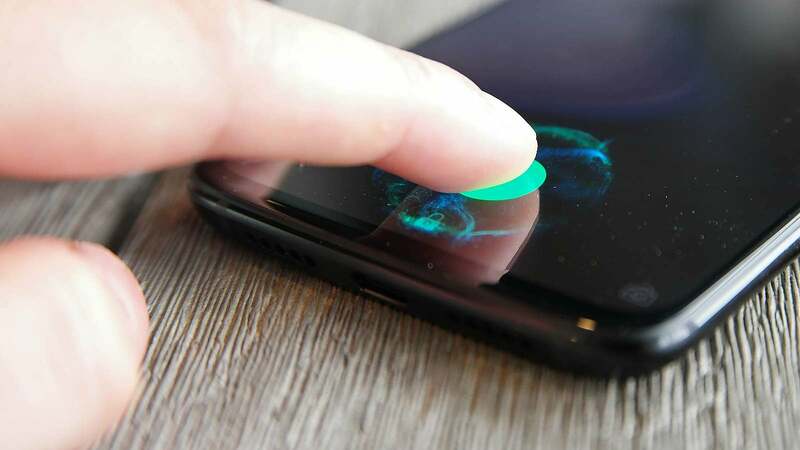 The in-screen fingerprint reader is usually just as fast as old-school capacitive readers, but every once and a while it does take a little longer to unlock the phone. The placement of the optical fingerprint reader means there wasn’t room for a headphone jack, but you do get a 3.5mm dongle in the box. For the first time, OnePlus is partnering with a carrier (T-Mobile) to sell the OP6T in a carrier store, while also adding support for Verizon’s network. The OP6T has great specs for the price and seriously good battery life.